I have just discovered a most amazing website for all us food and cooking lovers. Especially for Italian food and cooking lovers, of which I am definitely one! If past lives do exist I think I must have been Italian at once upon a time. Anna Maria Volpi's website has great recipes, advice and wonderful stories explaining the truth behind Italian food. Did you know Alfredo sauce doesn't 'really' exist in Italy? Not the way we (other nations) know it anyway. The man 'Alfredo' does exist. 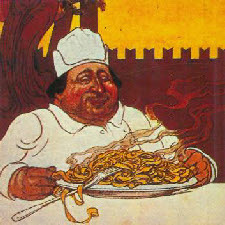 He was from Rome and created a simple pasta dish to please his pregnant wife who had lost her appetite. The dish consisted of fettuccine noodles, parmesan and lots of butter. And this is how pasta alfredo came to be! However if you were to ask for it in any restaurant in Italy they wouldn't know what you are talking about. This is such a home cooking simple combination that Italians don't really consider it a dish. Who knew?! Do you know what makes me think I was possibly an Italian in a past life? I have been making the real deal of Fettuccine Alfredo for years, probably since I was as young as 14 years old. I've never known anyone else who eats it, and had the same thought as the Italians, that it was a simple, home cooked, quick fix dish that wasn't necessarily worth mentioning. This just goes to show that no matter how simple and quick something is to make doesn't mean it can't be a most amazingly popular dish! I am so please to have found this website. I really believe that knowing the origin of the dishes one prepares can make a huge difference in the outcome. Thank you Anna Maria! Although making a dish as traditional as possible is a great thing, in the same breath, there is definitely nothing wrong to play with a recipe. On that note, please feel free to try my ultra creamy Alfredo sauce here.